This page offers tips that will help you to use this website more efficiently. The look and design of this website will change as we improve and add to this website. All items on this site are available for purchase at our retail store. At this time items are not available to purchase online but may be something we will do in the future. ATTN. Apple I-Pad users - See the mobile / tablet section below. COMING SOON: If any product shows coming soon please check the GUNS COMING SOON page to see if the firearm is in shipment to us. Most of the menus are self explanatory but there are options you may not know about. This is the menu on the left side. (See below for instructions for mobile as this is different) If you click on the catagory without using the drop down menu you will see everthing under that catagory. You will see sort and filter options. See below to use sort and filter options. Most firearm catagories will have the option to view all in that catagory at the top of the drop down menu for each catagory. There is options for by caliber, by manufacturer, and by type. AR's and AK's are under semi auto rifles. Sort and Filter is a great way to quickly find what you are looking for. Use the drop down menus seen below to do this. Product Details: If you click on the product you will see the product details (specs and what is included) as well as a sample of releated products such as holsters, accessories, and ammo. Want to see a plain text list without pictures? This is good for those with poor internet connections. Click the List All Items button to see the plain text list with links to the item details page. Keyword Search Bar: I have found this to not work very good at all. I always use the catagory (menu options via Mobile) options on the left side of the website. Use the search bar at the top of the website for quick searches. 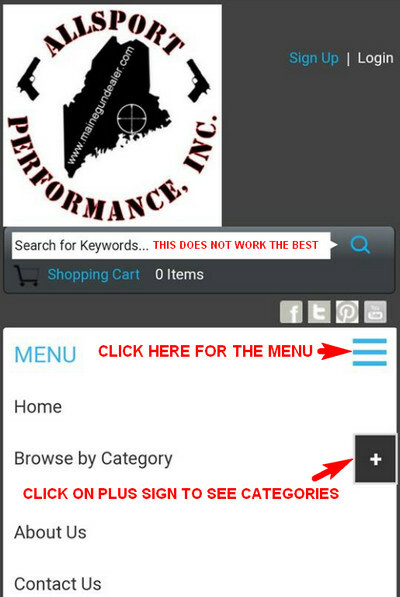 (See below for instructions for mobile as this is different) When you search for say Glock all items with Glock will show then you can sort and filter. If trying to be specific there are too many different variations such as Glocks maybe listed as G19 or 19 and Calibers maybe listed at 40S&W, 40sw, or 40 S&W (38sp, 38spl, 380, 380acp) which will cause you to see only a few results. Usually using broader terms and using sort and filter option maybe better. I tell all my customers to DO NOT USE the search bar. Using the categories is always the BEST option. I do even not use the search bar when I am on the website. Live Chat: See the bottom of the page for the Live Chat box. This is available during normal business hours. One of the most common questions on the mobile / tablet site is how to I find the drop down menus. There is a link at the top of the mobile / tablet page to view the drop down menus. Once you click on the MENU button you will have the option to browse by catagories and other options. See more links at the bottom of the main page. Search Bar: I have found this to not work the best. I always use the menu option and select catagories. Most of the time you have to use the filter option to find what you are looking for if you use the search bar. I am trying to get this corrected. Use the search bar at the top of the website for quick searches. When you search for say Glock all items with Glock will show then you can sort and filter. If trying to be specific use different variations such as Glocks maybe listed as G19 or 19 and Calibers maybe listed at 40S&W, 40sw, or 40 S&W (38sp, 38spl, 380, 380acp) so usually using broader terms and using sort and filter option maybe better.